Order Notes for Vend Ecommerce – How can we help? If you are using the latest version of the Alpaca Theme (2.3 or higher), you will now be able to include a field for order notes on your ecommerce cart page. This order notes feature will allow you to capture special instructions on how to prepare and deliver an order. When your customer arrives at the order page they will see an order notes box, this feature will be on by default and will be titled "Special instructions for seller". Important: We recommend this for advanced users only. Editing the wrong HTML/CSS can break your store and prevent customer access. Before proceeding you may want to take a backup of this text by saving it into a word document. If you aren't sure about this, get in touch with our support team for additional help. By default order notes are turned on for those with the latest Alpaca Theme (v2.3 or higher). 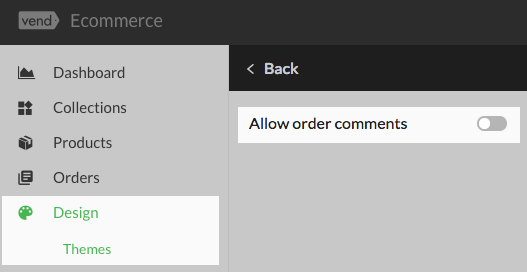 If you wish to disable the order notes box, head to your Customise theme page, and, in the Cart page section, uncheck the box “Allow order comments". What if I don't use Alpaca? If you use third party theme, you will not be able to enable the order note box by default. For more information, contact your theme creator for availability.